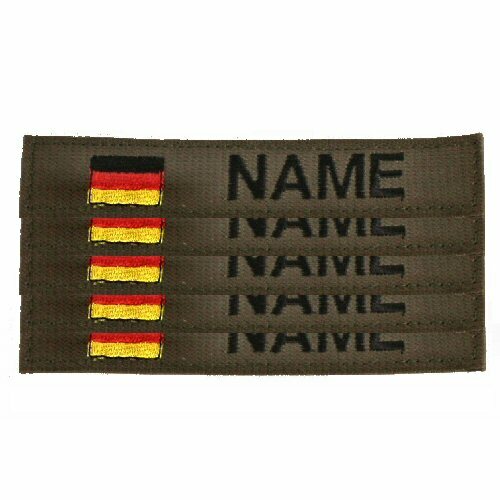 Custom set of name tapes on Olive tape background with full colour German flag and black lettering. The name tape is backed with hook velcro. This is stitched on at all four edges for durability. All edges are folded under. The name tape measures 25mm tall and 135mm wide. Capital letters, standard symbols and some special accent characters supported. Each set consists of 5 name tapes of the same name. Delivery times within 5 weeks. Please enter the name in the additional instructions box at checkout. Custom orders must be pre-paid before delivery.